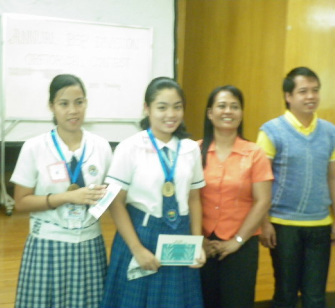 Joanna May de Ramon Pilla, a 4th year student of Senator Renato “Compañero” Cayetano Memorial Science and Technology High School (SRCCMSTHS), ranked 2nd in the 4th Division Oratorical Contest at Tipas Elementary School’s Conference Room last September 07, 2010. “An excruciating yet pleasurable experience”, said Joanna after two days of training with Ma’am Gina Poblete, our Assistant Principal. Her piece “The Equation for D” made her 2nd in the contest with her coaches Ms. Alma Almerol and Ms. Raquel San Pedro of the English Department. Among the twelve schools in the Division of Taguig and Pateros competed in the contest, only Taguig Science High School, SRCCMSTHS and Western Bicutan National High School made it top ranking 1st, 2nd, and 3rd respectively. The contest started at exactly 9:00 in the morning, with a doxology performed by the selected 4th year students of SRCCMSTHS, Jig Babasa, Kayra Alba and Kayna Alba; together with a special dance number performed by Guillermo Danipog III, Cheryl Tagyamon, Stacy Salsalida, Ernestina Moreno from the 4th Year; Ace Sarmiento, Maricris Quizon, Pancratius dela Rosa and Harry Paguirigan from the 3rd Year. “It is not always about winning, it’s about having fun all throughout the whole thing”, an inspirational remark by Joanna Pilla after her memorable experience in the contest.